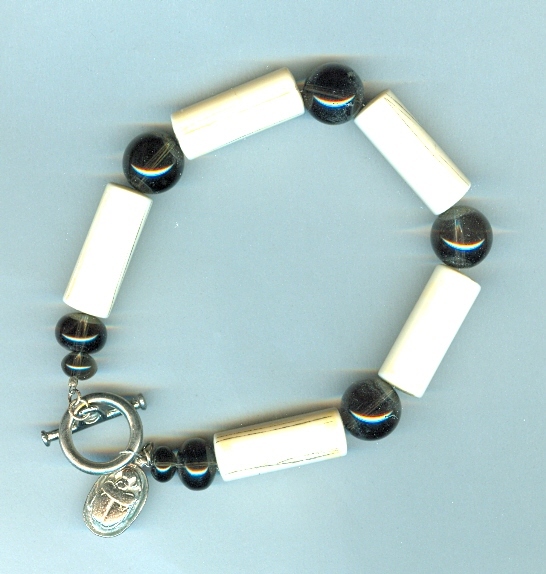 The tube beads in this bracelet are camel bone and were made in India in the 1970s. Each is about 1-1/8 inches long by nearly 1/2 inch in diameter. There is a disclaimer in the packaging stating that the animals were not slaughtered for their bones, but that the beads were made of 'found' bone. The tubes are spaced with BIG smokey quartz beads. I've added a silver tone toggle and scarab charm to make a bracelet about 10-1/2 inches long. Of course, I'll cheerfully resize it to a buyer's specifications. We do our best to accommodate, here at SPARKLE PLENTY.